With a Dropbox account, you can backup, restore and share your Grocophile data any time you have an Internet connection through Edge, 3G or WiFi. With this ability, it's now possible for people to share their inventory data and shopping list without both devices being simultaneously connected to the same WiFi network. A free Dropbox account will allow you to store 2 GB of data, far more data than Grocophile requires. Additional storage is available on a subscription basis. You can create a Dropbox account directly through Grocophile. 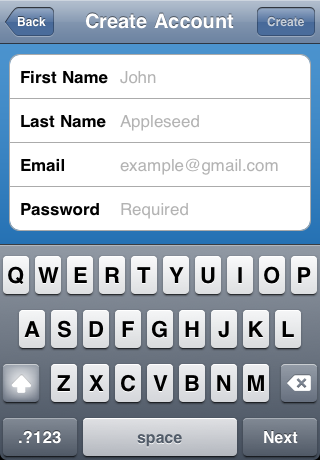 From the Tools screen, choose Web, then tap the Account button. Choose Dropbox at the top of the screen, then tap Help, then Create Dropbox Account. Enter the requested info then tap the Create button. Be sure to record your Dropbox password. You may begin using your Dropbox account immediately. You will also receive a message from Dropbox welcoming you and explaining how to get the most out of your Dropbox account. To back up your Grocophile data, go to the Tools tab, then tap the Web button. To configure your Dropbox account, press the Account button, choose Dropbox and enter your Dropbox username (your email address) and your Dropbox password. Once your account has been verified, Grocophile will store a token that will let you log in without entering your password. Note that Grocophile does not store your account password. You can visit your Dropbox account settings through a web browser to control Grocophile's (and other mobile apps') access to your Dropbox account. If you want to switch to using a different Dropbox account, you can tap the Account button and enter new account info. 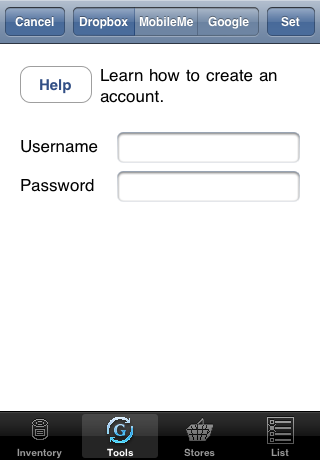 If you wish to clear the account name, tap the Account button, clear the username, then tap the Set button. 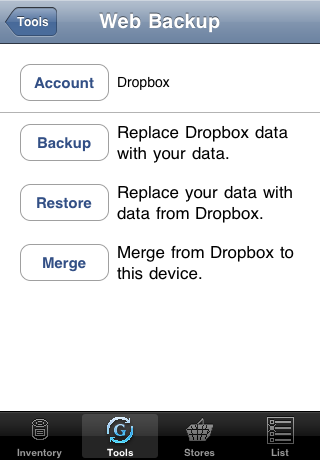 After entering your Dropbox account info, you'll be able to backup your Grocophile Data by tapping the Backup button. Grocophile will then copy your Grocophile data to your Dropbox account. To restore data to your device, or copy it onto a different device, simply log into the same account and tap the Restore button. Grocophile will look for the "Grocophile.groc" file in the "Grocophile Data" folder and replace the data currently on the device with that data set. Each time you do a backup, the contents of Grocophile.groc are replaced by the new data. Dropbox automatically keeps a history of document versions, so if you need to go back to an older version, Dropbox will allow you to do that. Although Grocophile allows users to share data when connected to the same WiFi network, Grocophile also allows sharing to occur over the Internet and doesn't require simultaneous connections. So, if Pat just updated the grocery list at home and uploaded it to a shared Dropbox account, Chris can download it from work and pick up the groceries on the way home. Once Pat has uploaded the new list, Chris can either do a Restore operation to replace any existing data with Pat's version, or Chris can Merge Pat's data into Chris' existing data. See the Merging Data section of the Tools tutorial for more infomation about the merging process. As with WiFi sharing, the merging process is one-way, so Chris will need to do a backup after the merge if Pat wants to download the merged version of the data. If you previously backed up your data to Google Documents and need to recover that data, you can simply move the Grocophile.groc document from your Google Docuements account to your Dropbox account. In your Google Documents account, locate the Grocophile.groc file you wish to recover. Click the checkbox to the left of the file name, click on the More Actions button, then choose Export. Choose "Plain Text" as the document format and click the download button. The file you download will be named Grocophile.groc.txt; rename it Grocophile.groc. In your Dropbox account, first make sure you have a folder called "Grocophile Data". If you don't have this folder, you can just do a backup from Grocophile to create it, or you can create it manually (it needs to be in the root level of your account, like the Photos folder). Once you have this folder, move the Grocophile.groc file into it. Once that's done, you can restore the data you previously backup up to Google Documents.